Summer Music Weekends returns to Rock City beginning Friday, every Friday through Sunday, showcasing local and regional artists, Birds of Prey Shows and delicious food. The summertime event runs Memorial Day through Labor Day including daily the week of July Fourth (June 29 – July 8) from 8:30 a.m. to 7 p.m.
Rock City Raptors shows hosted by Wings to Soar return for their 14th season featuring a variety of birds of prey in this entertaining, interactive show. 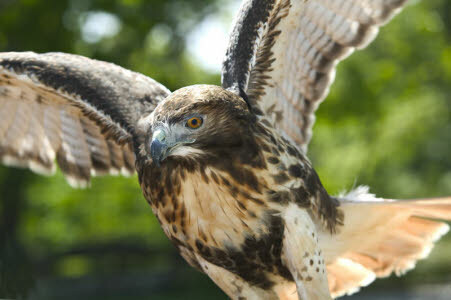 Watch rescued birds fly overhead with up-close encounters in the audience at 11 a.m., 1 p.m., 3 p.m., 4:30 p.m. and 6 p.m. daily. Live performances by NBC’s The Voice Finalist Amber Carrington, The Old Time Traveler Matt Downer, Highbeams and Tarryn Aimee Smith are scheduled for the Café 7 Stage. Café 7 opens seven days a week beginning Memorial Day weekend, 11 a.m. – 4 p.m., with extended hours on Fridays and Saturdays until 7 p.m. 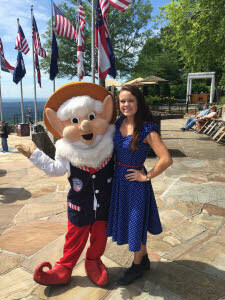 This outdoor restaurant with its unmatched views serves southern cuisine such as fried green tomatoes and pimento cheese, rainbow trout, Choo Choo Nachos and many other entrees, appetizers, desserts and drinks. Go to www.seerockcity.com/cafe-7 for the seasonal menu. 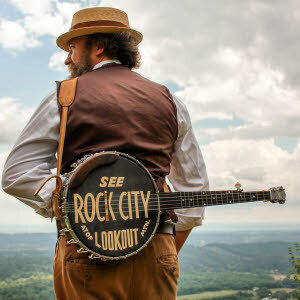 Rock City’s very own radio station WSRC broadcasts a 1930s-era show where special guest musicians perform, as well as children and guests who want to participate on stage. Other fun activities include creating a glow-in-the-dark firefly jar and guided Walking in Frieda’s Footsteps tours. Log onto seerockcity.com/summermusic for more details and the schedule of entertainment. Rock City Gardens is continuing its conservation partnership with Lula Lake Land Trust (lulalake.org) during this event and is committed to ongoing co-advocacy efforts with local community organizations. Just six miles from downtown Chattanooga, Tennessee, Rock City is an enchanted, 4,100-foot walking trail showcasing lush gardens, caves, soaring rock formations and breathtaking views.